This evening I happened to look at a couple of incoming emails from my apple account, to be greated by two in app purchases of £34.99 and £99.99. Having a family of apple users and not being able to do sub accounts we tend to run all the devices on 1 account. The predlets are very good about asking for downloads, plus they don’t have the app store password. So things seemed to be ok until these invoices. It appears that an app called Mustang Tuning Crash was the culprit. It seemed to have been a top down simple racer, aimed at kids and casual gamers. However it appeared to have an in game app purchase delux version that clearly one of the predlets hit the menu option for. At no point was there any password challenge, just instead “unlocking” something or other for nearly £100. I have no idea how anything like this ended up on the apple website given they apparently strict submission procedures. The apparent developer of this has a number of kids style games many with in app purchases. I have no idea if this is a rogue app that the developer has been hacked or is a deliberate rip off or a loop hole in the rules. Apple responded offering a refund, though I replied I was more concerned the rip off was sorted out. I had already contacted my credit card company and so my card was now cancelled. This is of course hugely inconvenient with so many recurring online payments in place. However it was best to check. I also remove any credit card from the itunes store. I am not sure how many other people have fallen foul of this but it all seems rather suspicious especially as the Developer “anibal soares” appears to not be very well represented on the web. 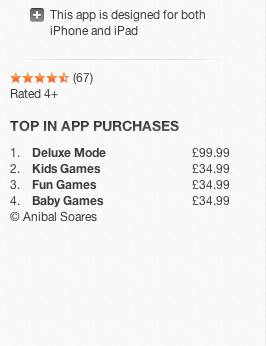 So whatever the loophole/hack/mistake is make sure you look out for in app purchases. Turn them off in the settings, but please avoid this app. If it is a genuine mistake then I will let you know but for now its a great way to lose £140 on a couple of clicks and I am sure the game was not that good (though I deleted the things from everywhere I could). ****Update 23/1/13 I wrote to Apple as a separate complaint from the one dealing with my particular money issue. I am due a reply within 48 hours. I referred to the comments and how many of them appeared to be spam names or automated in some way too. There is not an obvious fraud or dubious behaviour section. So I had to label it with “quality of content”. Hopefully they will act as this is surely not in the terms and conditions, though apple do have a wide set of standards I hope common sense prevails. Here is the note I sent via the Apple website. “Last night I reported what appeared to be fraudulent in app purchases of £99.99 and £34.99. On further investigation it appears many of the apps by developer claiming to be Anibal Soares https://itunes.apple.com/gb/artist/anibal-soares/id538318486 have a similar set of extremely dubious in game content prices. 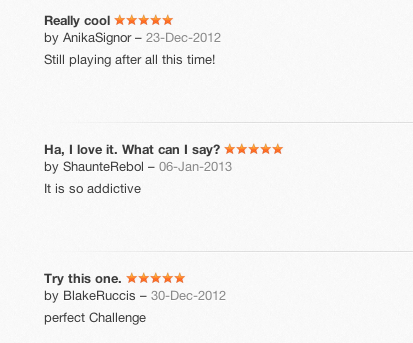 The reviews of the app appear to be generated names giving the apps 5 stars they do not look in general like people. **Update 23/1/13 As much of what I do is about understanding how technology and trends impact us a people I have to hsare the observation about the impact this has had on the predlets. Predlet 1.0 being slightly older but the owner of her own ipad mini understood this was something that should not happen, but you can accidentally be caught out. So she has chosen to spread the word amongst her friends to look out for this app. Predlet 2.0 being slightly younger took this to heart a bit more. Despite not being told off, the explanation of what happened definitely had him worried. This morning he talked about it out of the blue again and said “but dad whenever it said buy I did hit cancel you know”. I explained that it was the same as if you have something stolen. You try and be secure, look after things, but sometimes people choose to take things from you. If there is blame it is with the people doing the stealing and scamming. Very classy though to pick on kids! I contacted Apple again asking why I had not heard any more. It would appear the reason was as they had refunded my money then everything was OK. Clearly it is not. So it would appear that no further action was being taken. “Nadia here from the iTunes Store. I understand that you have not hear anything in regards to the charges you reported . I can certainly appreciate how motivated you must be to get this issue resolved quickly, and I would be more than happy to help you out with this today. The order you are inquiring about was refunded on January 23, 2013, and should be available within 5-7 business days from the date it was processed.Please contact your credit card company regarding questions about when the credit will be posted to your account. I just want to take a moment here to clarify for you what you were actually charged for. The items that you were billed for are what are known as In-App purchases. These are paid enhancements for apps. Things like weapons, items, extra levels, and other enhancements are types of in-game purchases which often fall into this category, and this is what you actually purchased, most likely unintentionally. So I am trying again! I have asked that they move this up from whatever 1st level support it is currently in. Or am I missing something that really was worth scamming people for £99.99 with a terrible little app? ****Update 5/2/13 This is probably getting a little bit silly now. I am trying to report a scam but Apple does not seem to have a “dealing with a scam” section anywhere. I just got a reply stating this. “Thank you for getting back to me with this information. I see that you are very concerns about this app and believe that it is a scam and should be removed from the store. I will surely provide you with all the information I have in order for your concern to be addressed. So the answer to dealing with a scam is to just leave some feedback. None of those sections have anything even approaching the category this needs to be dealt with. I have asked that i get put through to the fraud department, or at least somewhere that is not level 1 support. It is not the support desk’s fault, I understand that, but I am not happy with a fob off of ask someone else by filling in another form. I wonder if there is a regulatory body that deals with these things? Having gone back to the apple itunes helpdesk with a response that this really needed to be handled in a different way and could they pass me to someone appropriate I was given another huge brush off. Presumably from the helpdesk flowchart. “I see that you do not feel that our feedback page is the appropriate channel for your request. Ian I am truly sorry for any frustration this issue has caused and I can understand you desire to get your concerns address in regards to this purchase. I have contacted a senior advisor in regards to this issue and they advised me that our feedback link in the best avenue in order to address your concerns. Our feedback page allow for suggestions or improvements as well as customer concerns and it is regularly checked. They also advised me that you can submit multiple request as well as having your friends and family submit there concerns about this issue using the feedback link. This really seems strange as I have pointed out to them I am already in contact with the company and they should be the point at which this gets passed on. So I am trying one more time to get passed to the right people. I still can’t see how the comments box, not having my family and friends fill it in too is supposed to help in anyway. I am trying here to help other apple users? I do not understand them not being able to at least take a look and see? ****** Update 7/2/13 part 2. Having written back to the helpdesk in order to try and get an explanation about why a rip off application (or genuine mistake) of this nature is allowed I attempted this response. “That is really an unacceptable response as this is not a minor suggestion. 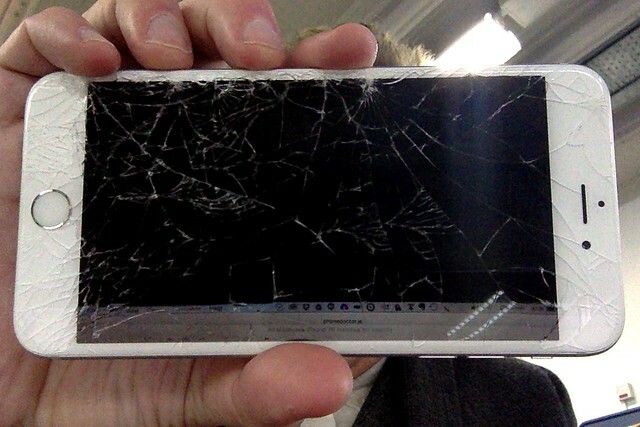 It is not very joined up of apple. The app is on the store and that is where the link is to raise a concern. Please put me in touch directly with the right people not redirect me to another web page where we have to go through this again. I am considering reporting this to local authorities which I am sure is not the sort of thing that apple wants ? Whatever your help desk process is this needs to be escalated up several levels. “I see that you believe that is issue to too major and providing feedback will not correctly address this issue. I can definitely relate to your concern as you believe this particular app is a scam and would like to report this issue. Ian, as an advisor to the iTunes store, I cannot comment on the functionality of the in app feature for that app. Each application is built in with a possibility of upgrading and or purchasing upgrades to certain apps and games. As for this being a scam, please note that this has always been a feature and this is a feature you can turn off on your device. I would also ask that you submit feedback via the link I provided earlier. Rest assured that all submission are review our feedback link is the best avenue for your concerns to be addressed. 1) Tap Settings on your device’s home screen. 4) If necessary, tap Enable Restrictions and enter a passcode. This passcode will prevent restrictions from being disabled without your permission. 5) Scroll down to the Allowed Content section. Switch the In-App Purchases option to OFF. Enter your Restrictions passcode if prompted. So thats it, no more responses from the itunes store wheer you are able to register a concern or complaint. They seem to consider that my individual concern over money taken is all that mattered and that my concern for other people is not relevant. I am sure it is just english cut and paste but “As for this being a scam, please note that this has always been a feature” may say it all. So what now? This post is getting very long, but this need to be resolved Apple? It seems the global problem of bait apps and Apple’s lax attitude to them has caught up with them at least in the US where the class action rules. They are having to offer compensation and refunds to people caught by these apps. It is incredibly wide spread and so they would have taken a lot of money in percentages from these scams. The ruling has been reported here and here thanks to @katerussell and @hardlib for sending me the links. It is important that Apple have taken steps to patch the iOS to remove the daft 15 minute window of opportunity for these sneaky apps to steal the money from our kids. I am not sure how people can live with the fact they do that, but dishonesty is dishonesty. The ruling doesn’t effect the UK, but this is not really about compensation is it about Apple finally trying to do something about a problem that have complete power to stop. It makes a mockery of their app approval process though it would seem? I thought I should try the Unity modules for a new motion sensing library called BitGym. A Unity/webcam based motion sensing toolkit that works with depth as well as lateral movements. It, like many Unity3d packages, is just so straight forward to get working. You simply import the package then add a script to an object and there you have it. An interesting twist though is that you are not locked into the laptop. Unity being able to target different platforms as a runtime (with the right licences) you can build iOS and Android sensing apps. Determining size and shape and motion on a camera with a single plane it is of course going to be tricky to look at detail of physical form as with the kinect which is really a 3d scanner. However for some sports applications and rep counters it may well be all that is needed. Some further investigation is on the list of things to do. The toolkit is available to anyone to download and experiment with but that is on a non commercial licence. Obviously full licences need to be bought to do any more with the kit, but it certainly is worth looking at if you are interested in such things. 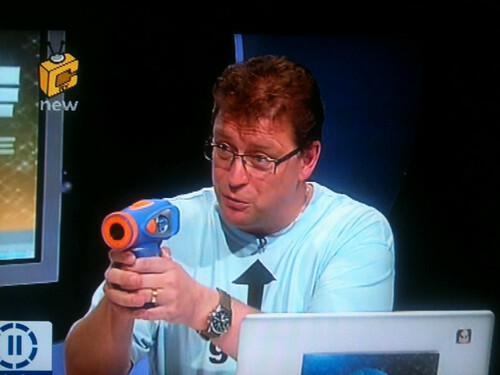 Last night at 9pm a very innovative ad aired for the new Gadget Show. It relied on an iOS application installed and running ready to go. 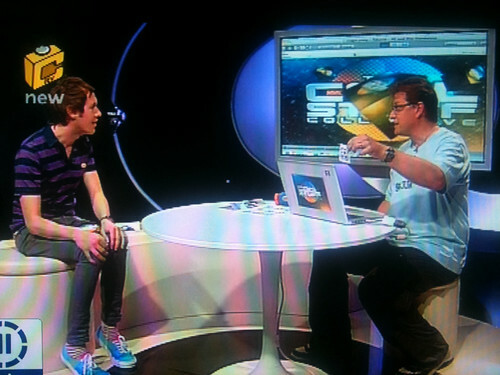 At 9pm the tv promo started, the jingle ditty at the start cued the application to life to run the same promo advert. The TV was of course a fixed camera, but the app was a full 360 video. Moving the iPad around looking up down left right and behind you could follow the action, and it was perfectly synchronised to the TV advert. So as Jason dashed around the studio you could follow him. The video was of course preloaded in the app, but it was a very impressive experience. It was a polished example of innovation using both the TV screen and the ever increasingly common iPad. The video is available on the web here, in the same sort of way the old quicktime VR’s were back in 1998 🙂 It was the linking of the fixed TV showing what you would have seen combined with the physical activity of moving the iPad around whilst held up that made this more engaging than just a 360 video on the web. Of course this would have been even better taken to the next level. If we were all in the studio too and were aware of one another. Think a virtual world synched to the TV broadcast. Where we have the same sort of control on out view of the system. The second screen as it is being called is becoming very influential. It has been great being able to watch the Sky coverage of F1 both on the TV and with the app on the iPad letting me look at stats, track positions and in car driver feeds. It is an extension of us sitting here with our wireless enabled laptops, or having moved the desktop PC into the main living area (the previous wave) to be able to look things up, to follow links to add to our enjoyment of a previously passive experience. It is all a part of blending realities with all the new forms of visualisation and and interaction hardware that we now have available to us. Why restrict us to one screen? 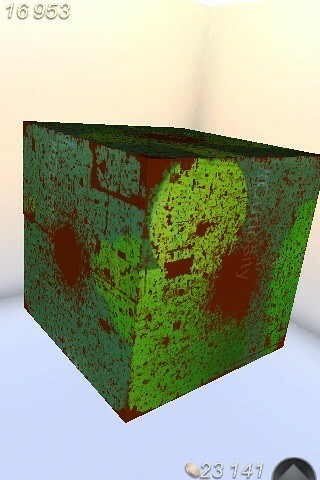 I already have the iOS basic licence and unity3d installed so it was a little less clear what to do. On the store page there is a licence upgrade link in there you have yo paste in your existing licence number then you are able to “buy” for free the upgrade you need. Unity will then send you a new licence number that you reactive in the unity client with the menus unity/serial number and away you go you now have targeting for publishing to web, windows, mac, iOS and android all enabled. What are you waiting for ? It is a brilliant dev environment. There is a definite theme of physical toy and game interaction emerging. An interesting one that appeared recently is LEGO Life of George. This comes with a build platform for LEGO bricks and a app that is used to identify your creations through the camera, which in turn unlocks new things in the app. I like that George is a software engineer. A fellow g33k but with lots of interests outside his cubicle. This will of course be the start of a greater interaction between the physical and the virtual world. Whilst this is pattern matching and creating relations to visual tags it will not be long before we can scan in something we have built with LEGO in 3D and drop it into a virtual environment. 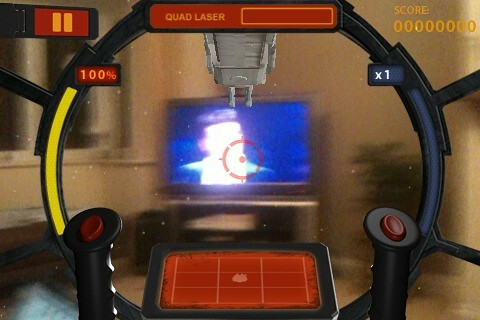 For some reason we had XFactor on tv last night whilst we were both messing with iphones and the web. I decided it was about time to try the Star Wars Arcade Falcon Gunner on the iphone. This app uses an entire sphere around you as the playing field as you shoot down incoming tie fighters. You can move the gun turret in the playing space both by moving and spinning your body around and by a little bit joystick control. 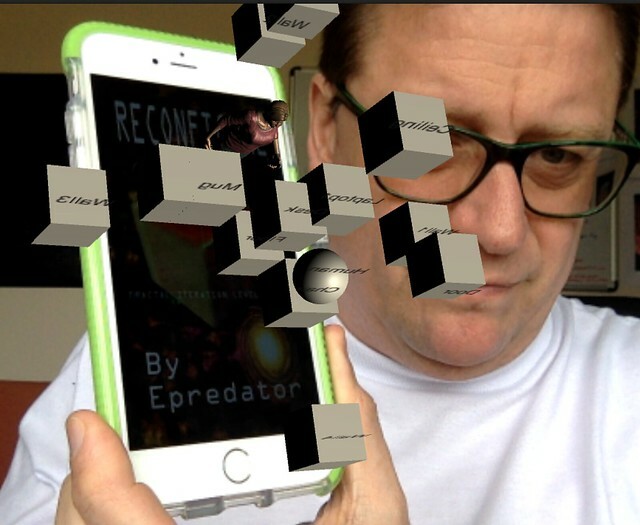 In a nod to AR and to give a bit of a frame of reference along with the Elite style scanner it patches in the video from your iphone. This led to the accidental mashup whereby I was about to start shooting overlayed tie fighters and as I spun around Simon Cowell and Xfactor came into view. Gets you thinking about head up displays and being able to see and maybe share information on people and things around you doesn’t it. XFactor (which is the first we have really seen this series) was truly awful too as many great Beatles songs were ruined IMHO. Star Wars is truly awesome!. Net win in the favour of Star Wars though. Star Wars AR – StAR wARs I guess? This video is doing the rounds of using the world around you as a backdrop for playing a tie fighter shooting turret game on the iphone. There have been some great advances in using the iphone tilt and touch to control Star Wars related games and I am sure the Kinect game will be equally evocative with motion control for force and lightsaber. It is probably that 1977 and Star Wars in general has been the grounding for many of the gamers and inventors of today that it is so obvious to replicate the things we saw back then into games tech in out hand today. Likewise these advances in holography quickly get on to referencing the holograms seen in Star Wars. All very amazing tech indeed and closer than we think. On The Cool Stuff Collective this week, that just aired. I got to talk a little about AR. Whilst we did not show any of the more traditional camera/marker overlay for various reasons I think we covered a lot of AR ground from marker triggering with fiducial markers and creating magic mirrors all the way to the Vtech kids video camera that acts as a live AR magic lens. Then mentioning the display contact lenses as a future way of delivering information to us in physical world. It was particularly cool for me to be able to use the Junaio triggering Royal Mail stamps that kick in a video of Bernard Cribbins. Its a real bind getting a video feed out of some of these smartphones, this was a Droid, but the Iphone is also very awkward. So whilst we did connect and did trigger the video and it really does work it was better for Archie Productions to edit in the actual video. I think we may end up with some more AR content down the line though as there are some really good products and demos like the ones we got to see in Finland OEM 2010 using Total immersion D’Fusion. For the program I had created a Junaio channel for Feeding Edge which you get a floating Cool Stuff text model floating above the Cool Stuff TV logo if you point at it. Its all very doable! Just did not come out on the screen too well without that pesky video feed and screen shots don’t do AR justice. Also the website going live with some Uk only video did mean I could pop into SL and do some virtual world augmented reality. Epredator getting to see G33K me streaming into a media texture talking about another virtual world the brilliant Ledo Universe Online which goes live in a few days. You have to love the meta loop !